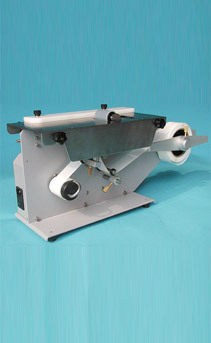 for use with Small Rolls in Manual Applications or Product Packaging. Manual dispensers require a person to pull the liner to dispense each tab. Select the dispenser type based on the size of the tab ordered. To Order: select the dispenser below by entering a quantity in the quantity field and then click on the Add to Cart button. Accommodates Small Rolls from 1/2" thru 3" wide shown on the Small Rolls Page Only! Accommodates all the Small Rolls shown on the Small Rolls Page Only! 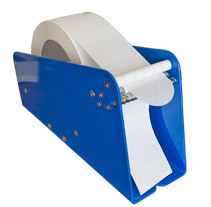 The Tach-it® SH404TR automatic label dispenser automatically advances a new tab each time a tab is removed. This automation dramatically speeds up the sealing process. 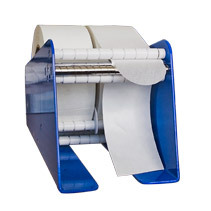 This dispenser will handle all of the individual rolls of wafer seals displayed on this page. The Tach-it® SH404TR uses an optical reader allowing it to sense small, large, opaque or transparent tabs that are round or irregular in shape. The machine is durable and reliable. Changeover and set up is fast and easy and requires no special training or tools. 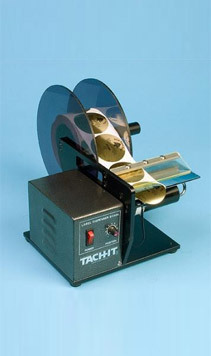 Dimensions: length 14" x width 10" x height 11"
The Tach-it® Model 6500 Label Applicator is designed to apply wafer seals directly onto small packages when the package is slid over the table and roller. The set up of the machine is simple and accurate and dramatically faster than hand applications. The applicator automatically advances the next tab which allows for continuous sealing with round or irregular shaped tabs that are either transparent or opaque. Changeover and set up is fast and easy and requires no special training or tools. Dimensions: length 22.5" x width 7.5" x height 10.5"
Max Dia: Core 3" OD: 9.75"